The Red Skiff, busted and beaten by waves in the tidal zone near the Grindle Point Lighthouse on Islesboro, Maine. 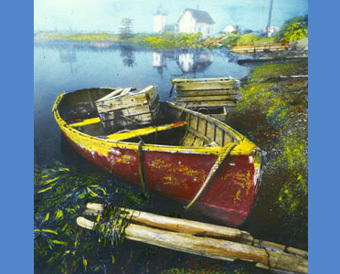 A black and white photograph shot on infrared film and then hand-painted with Marshall transparent oils, using an old-fashioned technique made famous by turn-of-the-century artist Wallace Nutting. The Outdoor Life TV channel filmed Jack shooting and painting this photograph in a half-hour documentary which can be viewed by contacting us.